Today is the first of the month which means tons of new printable coupons! 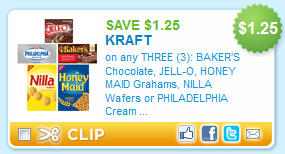 This morning I am seeing some good ones, including this $1.25/3 Kraft Coupon, valid on Baker’s Chocolate, Jell-O, Honey Maid Grahamas, Nilla Wafers or Philadelphia Cream Cheese. This coupon is RARE, so print it while supplies last!